Bloom Bros (Publisher) . 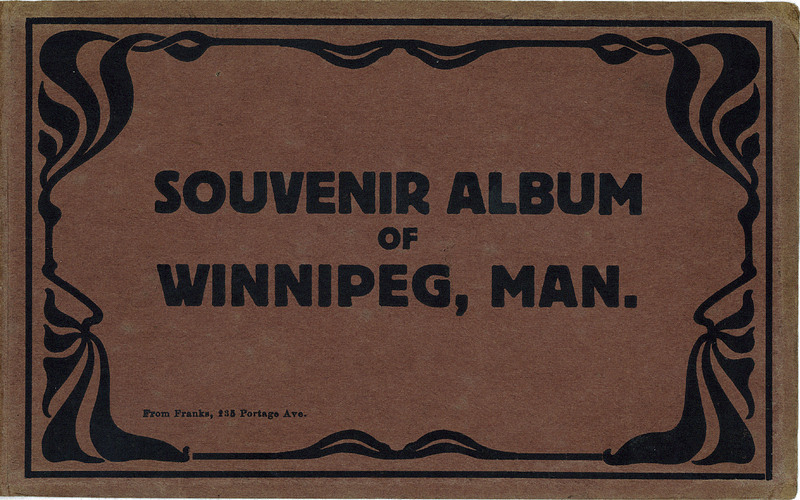 Souvenir album of Winnipeg, Man.. Winnipeg: Published by Bloom Bros., Winnipeg, Canada, [1910-1930]. 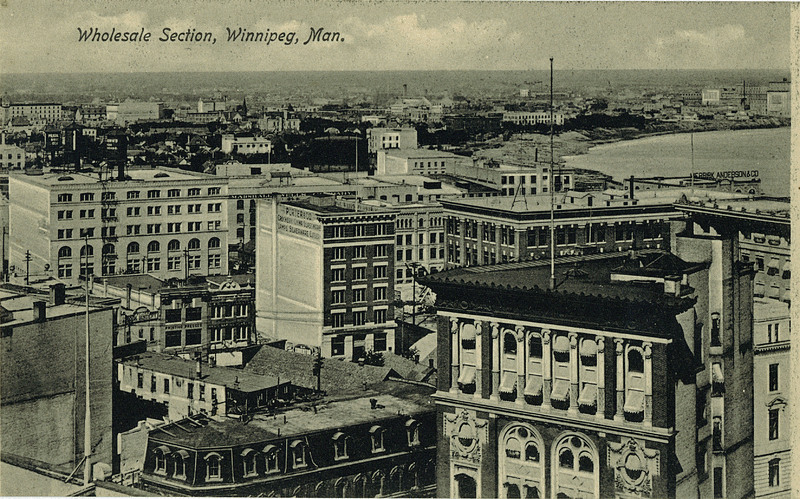 Description: The front cover of an accordion-style booklet of 10 postcards showing various Winnipeg landmarks. On Front: From Franks, 235 Portage Av. Other: [printed on the back of each postcard]: Published for Frank R. Morris by Bloom Brothers, Winnipeg, Man. Bloom Brothers (Publisher) . C.P.R. Depot, Winnipeg, Man.. Winnipeg: Published for Frank R. Morris by Bloom Brothers, Winnipeg, Man, [1910-1930]. Description: The Winnipeg Canadian Pacific Railway train station fills the background of this photo while the foreground features a streetcar as well as people looking at a steam locomotive (the "Countess Dufferin") on display in front of the station. On Back: "Made in Germany"
On Back: "[printer's no.] 13 8013"
Bloom Brothers (Publisher) . 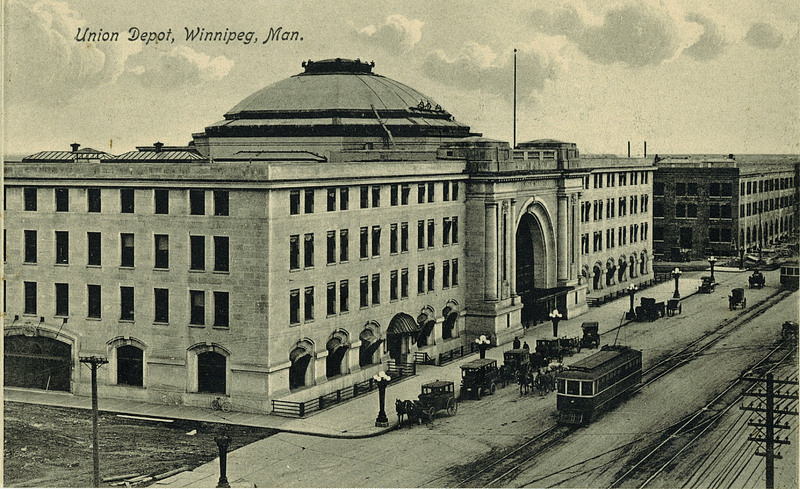 Union Depot, Winnipeg, Man.. Winnipeg: Published for Frank R. Morris by Bloom Brothers, Winnipeg, Man, [1910-1930]. 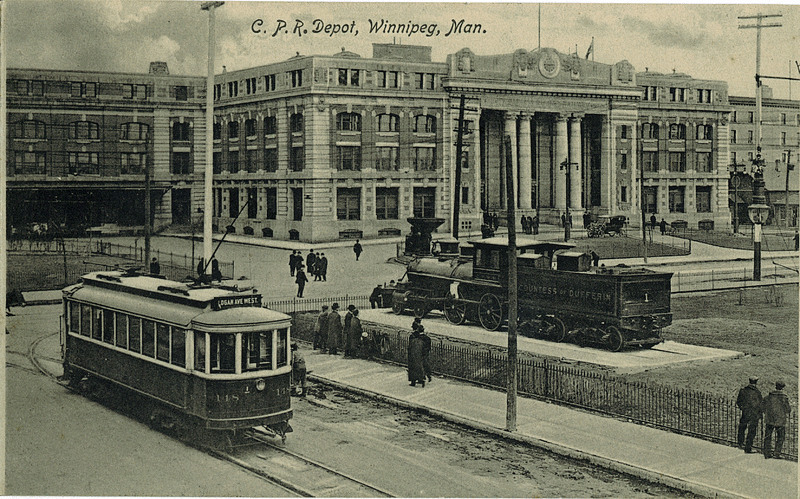 Description: A view of the Union Railroad train station in Winnipeg with streetcars, horse-drawn vehicles, and automobiles also visible in the foreground. On Back: "Made in Germany." On Back: "[printer's no.] 13 8014"
Bloom Brothers (Publisher) . City Hall, Winnipeg, Man.. Winnipeg: Published for Frank. R. Morris by Bloom Brothers, Winnipeg, Man, [1910-1930]. 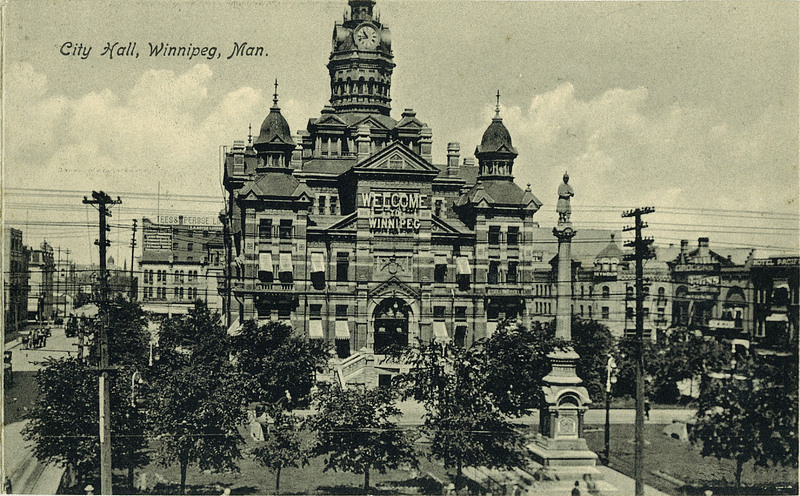 Description: Winnipeg's second city hall which was completed in 1886. On Back: "[printer's no.] 13 8015"
Bloom Brothers (Publisher) . 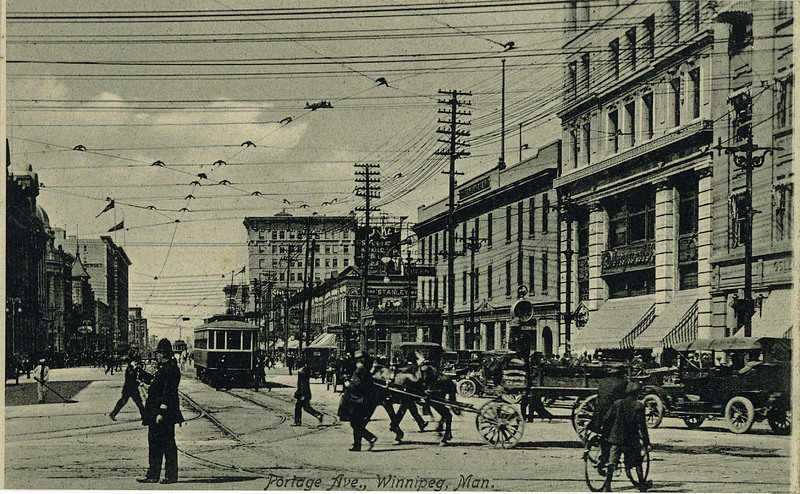 Portage Ave., Winnipeg, Man.. Winnipeg: Published for Frank R. Morris by Bloom Brothers, Winnipeg, Man, [1910-1930]. 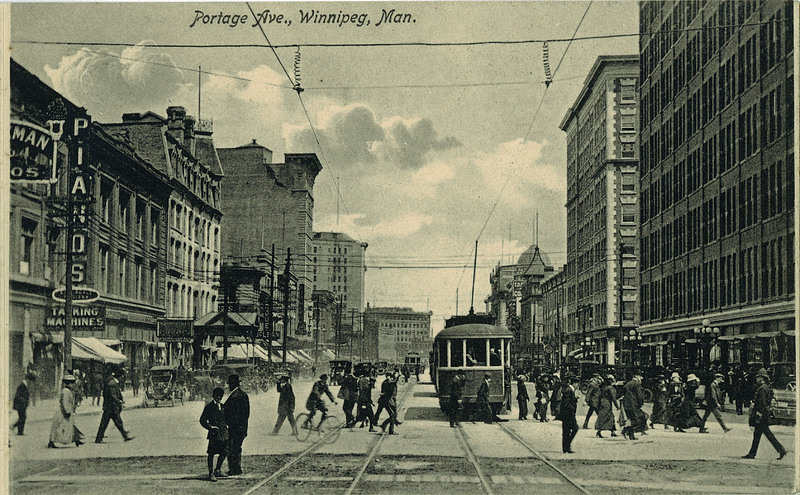 Description: The traffic cop is obviously needed as streetcars, automobiles, horse-drawn vehicles and pedestrians can all be seen in this photograph of the busy commercial street of Portage Avenue. On Back: "[printer's no.] 13 8016"
Bloom Brothers (Publisher) . 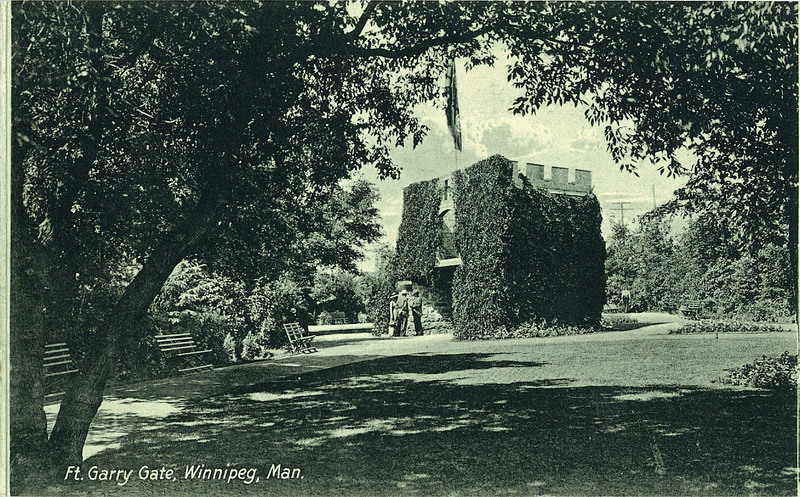 Ft. Garry Gate, Winnipeg, Man.. Winnipeg: Published for Frank R. Morris by Bloom Brothers, Winnipeg, Man, [1910-1930]. Description: Two men and a woman socialize outside Ft. Garry Gate in Winnipeg. On Back: "[printer's no.] 13 8017"
Bloom Brothers (Publisher) . Wholesale Section, Winnipeg, Man.. Winnipeg: Published for Frank R. Morris by Bloom Brothers, Winnipeg, Man, [1910-1930]. Description: A commercial district in Winnipeg. On Back: "[printer's no.] 13 8018"
Bloom Brothers (Publisher) . 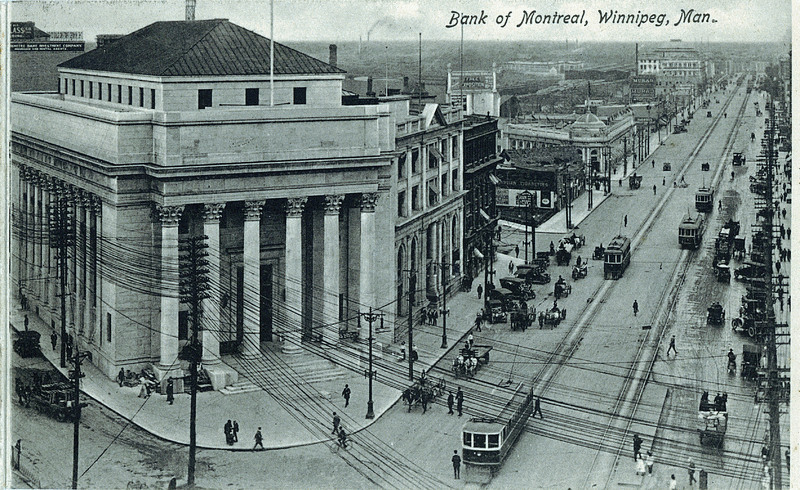 Bank of Montreal, Winnipeg, Man.. Winnipeg: Published for Frank R. Morris by Bloom Brothers, Winnipeg, Man, [1910-1930]. Description: Situated on a commercial street in Winnipeg, the Bank of Montreal strikes a significant presence. On Back: "[printer's no.] 13 8019"
Description: Pedestrians and a cyclist crossing in front of a streetcar on Portage Avenue. On Back: "[printer's no.] 13 8020"
Bloom Brothers (Publisher) . Winnipeg from the Northwest.. Winnipeg: Published for Frank R. Morris by Bloom Brothers, Winnipeg, Man, [1910-1930]. Description: A bird's eye view of the rail yards and skyline of Winnipeg. On Back: "[printer's no.] 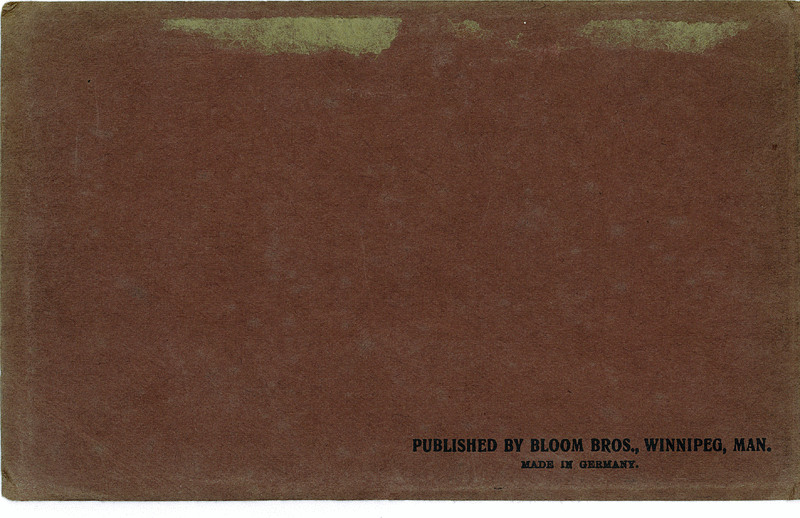 13 8009"
Bloom Brothers (Publisher) . Eaton's Store, Winnipeg, Man.. Winnipeg: Published for Frank R. Morris by Bloom Brothers, Winnipeg, Man, [1910-1930]. 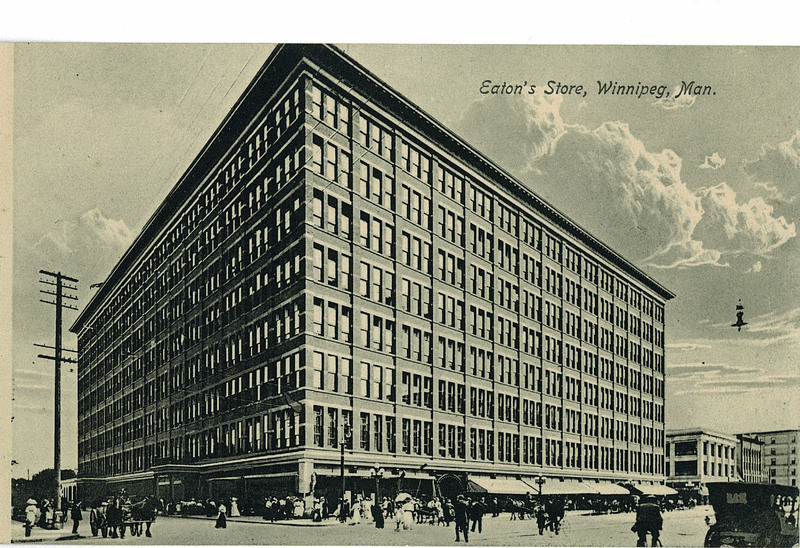 Description: A view of the Eaton's department store in Winnipeg. On Back: "[printer's no.] 13 8010"
[Inside back cover of postcard booklet]. 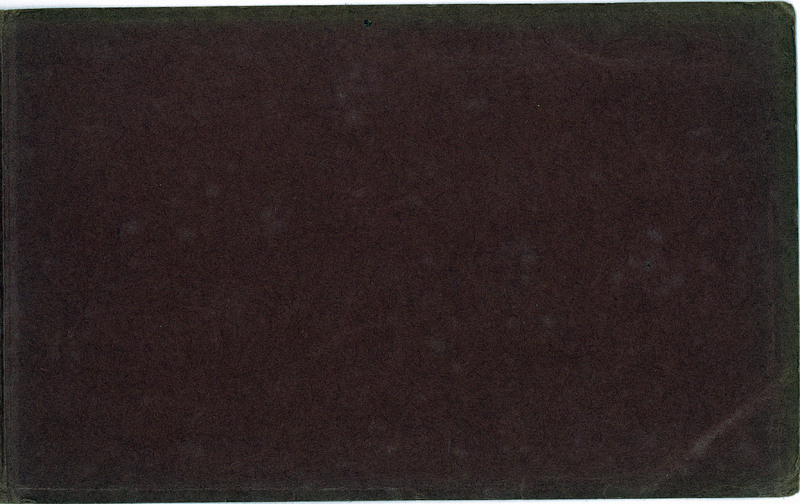 [Back cover of Souvenir Album of Winnipeg, Man.]. On Front: Published by Bloom Bros., Winnipeg, Man. On Front: Made in Germany. 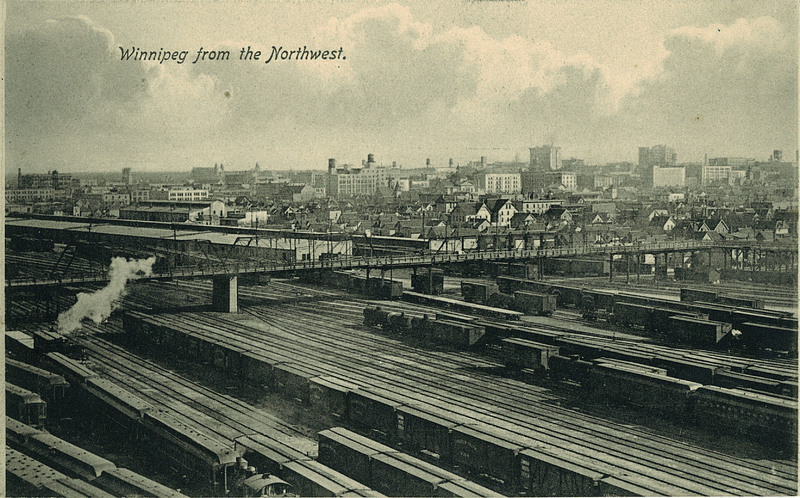 Description: Booklet of post cards from Winnipeg, Manitoba. Post cards include: C.P.R. Depot, Winnipeg, Man. ; Union Depot, Winnipeg, Man. ; City Hall, Winnipeg, Man. ; Portage Ave., Winnipeg, Man. ; Ft.Garry Gate, Winnipeg, Man. ; Wholesale Section, Winnipeg, Man. ;Bank of Montreal, Winnipeg, Man. ; Portage Ave., Winnipeg, Man. ; Winnipeg from the Northwest; Eaton's Store, Winnipeg, Man. On Front: From Franks, 235 Portage Ave.
On Back: "Published for Frank R. Morris"
PC001786: "Souvenir album of Winnipeg, Man." is licensed by University of Alberta Libraries under the Attribution - Non-Commercial - Creative Commons license. Permissions beyond the scope of this license may be available at http://peel.library.ualberta.ca/permissions/postcards.html.